Hello and Welcome to the eighteenth episode of Coexisting With Nonhuman Animals. This episode I have two stories, The Mad Butcher Has Cancer, and the Catcha Cray Machines Return. Listen now by downloading directly from here or, better yet, subscribe in iTunes to get each episode automagically! Most New Zealanders, especially those further north from where I live, have heard of Peter "The Mad Butcher" Leitch. Leitch has made his fortune from his chain of meat shops, although he has now since retired, hes currently 66. "The Mad Butcher" is one of the most well known and respected New Zealanders, he was granted "The Queens Service Medal", for his donations to charity throughout his life. Its interesting that he now campaigns for Allergy New Zealand, as his stores sell Meat and Milk. As a well known New Zealander, The Mad Butcher has been portrayed in Comedy shows, normally focusing on his weight and clothing, and his gruff voice. Here are three examples. In the first, the actual Mad Butcher appears as a "Meat Pimp", driving about in an old 70's car, dressed in a fur coat with a large floppy hat, a pimp's cane and jewellery. The Mad MAD Butcher was a character on the not very funny Pulp Sport show, where an actor portraying the Mad Butcher would run about crazy, as if he were truly Mad. In this skit he makes a "meat shake" to prove how crazy he is, blending meat with a few litres of cows milk and drinking it from a yard glass. At the end, he throws up on camera, such is the state of New Zealand television, no doubt partially funded through my taxes. I was wondering what the heck that butchered, get the pun?, midi soundtrack was, and it hit me, "oh, I get it, hes Mad, so they play a crappy version of Bad, get it?" The Mad Butcher is probably one of the most "kiwi" male celebrities, he promotes eating meat and watching sport, and now the Mad Butcher has cancer. I've commented on news stories about The Mad Butcher, mentioning the well known links between eating meat and other animal byproducts and cancer, although I was always respectful that he is still a normal person with a potentially fatal illness. Many in my family have died from Cancer, and I wouldnt wish it on anyone. I do think its more than fair to point out, while being respectful to Leitch, that there are long known links between consuming animal byproducts and cancer. There have been other well known families related to selling Animal Byproducts which have had early deaths and health problems to do with their own products, John Robbins of Baskin Robbins Ice Cream comes to mind. In New Zealand, we dont have Baskin Robbins, so its not very effective telling people about John Robbins and his book "Diet for a new America" if you have to explain his famous family's business. The Mad Butcher has long asked men to look after their health, and he went on the Breakfast morning show to talk about his cancer. I doubt its anything like what chickens suffer before ending up at his stores, to be sold for a "bargain basement" price. I guess now I can point to Peter, "The Mad Butcher" Leitch while mentioning the links to cancer. Being honest though, I never use any health reasons for being vegan, as its the ethics that matter to me. And I'm certainly not making fun of the Mad Butcher for having cancer, I wouldnt wish it on anyone and I hope he recovers soon. I do think that we all need to be careful about our health, men included, and that we should all be aware of the links between cancer and eating animal products. My other story is about the Catcha Cray machines returning, there was an AWESOME story on Close Up featuring an interview with the man behind the machines, and Hans Kriek, of the Animal Welfare group SAFE. As a recap, the Catcha Cray machines are like the skill tester arcade machines, where you control a claw that comes down inside the case, and you try and grab a prize and drop it into the little chute to the outside world. Catcha Cray has a lobster tank, filled with "crayfish", which is a New Zealand term for lobsters. SAFE, a local animal welfare group has been protesting the Catcha Cray machines for sometime now. and they showed up in the news again. I wanted to play this clip, if just for the great interview between the man behind the Catcha Cray machines, and Hans Kriek of SAFE. The Catcha Cray guy was quite furious during the interview, he bangs a stack of paper that he claims is the indisputable proof that his sick game is "humane". Hans stays very calm throughout the whole interview, and the Catcha Cray guy looks quite angry. I think thats a great way to appear when you are being challenged in public about veganism, to remain calm and to the point, and not to get angry despite any prodding you get from the other side. I thought it was interesting how the Catcha Cray guy pulls evidence of a "secret agenda" behind SAFE, that they are into all kinds of crazy things such as protesting race horses and pets....I was really interested to see how Hans would handle it. For the most part, he just remainded calm. I think if SAFE came out and actively promoted Veganism, he wouldnt have to worry about people trying to expose what a Vegan like Hans actually believes is a humane way to treat animals, meaning to not use them for any use at all. It seems Hans was right, and that the SPCA has been visiting pubs with the Catcha Cray machines and "disabling" them. will be closed down so that would be a good outcome to this campaign! 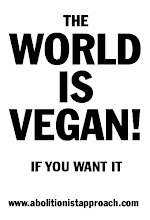 with a 'Go Vegan" campaign. I really hope SAFE start promoting veganism, a few of my vegan friends have been asking for quite some time now. I worry that most people watching the single issue campaigns, such as these "Catcha Cray" machines will continue eating crayfish, or "lobsters", believing its absolutely fine to kill animals, as long as they are not played with before they are killed for you. The more people promoting actual Veganism, the better. If you want to contact me, even just to say you listened, send an email to jaywontdart@gmail.com, or on Twitter, twitter.com/ j a y w o n t d a r t, I'd appreciate it.